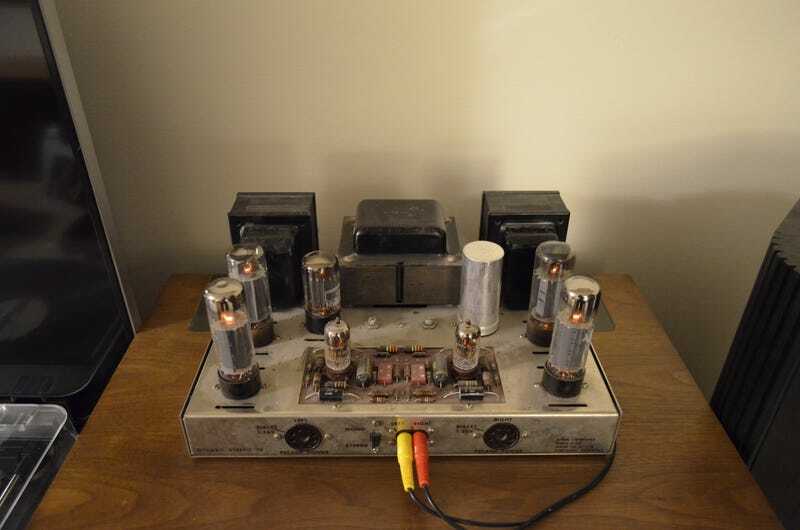 My friend is in an apartment at the moment, and has no use for his tube amp, so as I mentioned in my previous post related to my sound system, he lent it to me in an attempt to bring me over to the vacuum tube side. The amp is the oldest piece of equipment I’m running now, a Dynaco from 1959. The little Dynakit 70 is now sitting on top of my big Sansui 9090DB. the auxiliaries are running through a Nikko Beta attenuator, then the Dynaco runs the high end of my Infinitys, and the Sansui is running the low end. Now I know how to bi-amp things. I was reading up on my speakers a while back, and saw somewhere that “if you’re not bi-amping Kappa 7.1s, there’s no point owning them”. I get understand that now. I already thought these things sounded amazing, but this made a pretty shocking difference. Also, check out the weirdness that is the tweeter and the mid. The magnets are the same size as the plastic surrounds, and the voice coil of the mid is the size of the whole dome. There isn’t much point trying to describe the difference in sound with no frame of reference, but i highly recommend tube amps, bi-amping power hungry speakers, and Steely Dan about as loud as still sounds good. I like seeing the tubes glowing under the cover, so I turned the lights off and took some blurry pictures that I enjoy. So yeah. He successfully brought me to the vacuum tube side. The saga of my mostly free sound system continues.